Combine Smileys with HD25 headphones and what do you get? 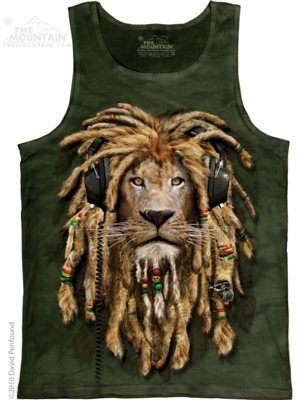 This awesome vest! 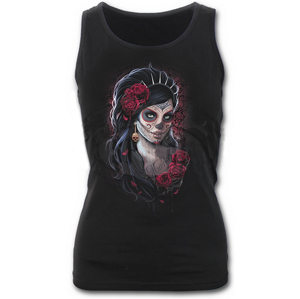 Glow under UV design on a high quality black vest. Plus a small fluro yellow HEAD SPACE on the back! Spiral Direct, the Original. Made in England. 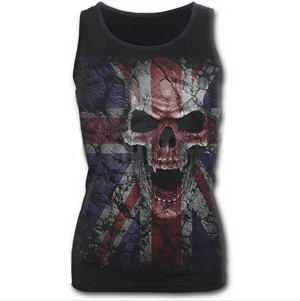 This awesome rock like skull emblazoned with the flag of the UK is sure to give any lost soul some sense of belonging. Design inspired by the original Space Invaders machines. Press start to party! Black vest with a fluro green logo on the front and small fluro green HEAD SPACE on the back. Both glow under UV! Design inspired by the original Space Invaders machines. Press start to party! Black vest with a fluro pink logo on the front and small fluro pink HEAD SPACE on the back. Both glow under UV! HEAD SPACE Raving It Up black vest with White and Fluorescent Yellow logo on the front and a small fluro yellow HEAD SPACE on the back. Both glow under UV! HEAD SPACE Raving It Up black vest with White and Fluorescent Pink logo on the front and a small fluro pink HEAD SPACE on the back. Both glow under UV! Awesome Head Space Sleep, Eat, Rave, Repeat�design on a�black vest�in�fluro green, yellow and pink. Plus a small�fluro green HEAD SPACE on the back. 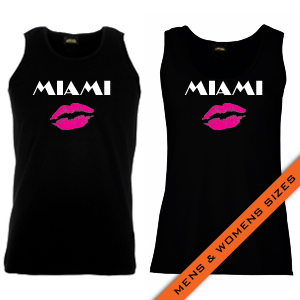 ALL�glow under UV! Play Hard Drum Harder vest from Head Space! Grey and Fluro Orange (glows under UV!) design on the front and a small fluro orange HEAD SPACE on the back. 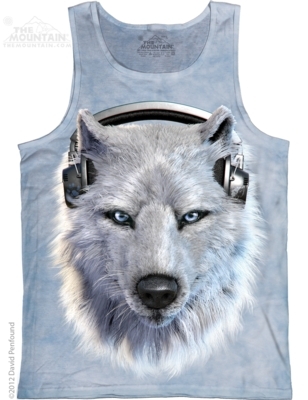 This tank top for both men and women is not only comfortable, it also has a great image of�music loving,�white wolf DJ.�Design by The Mountain. 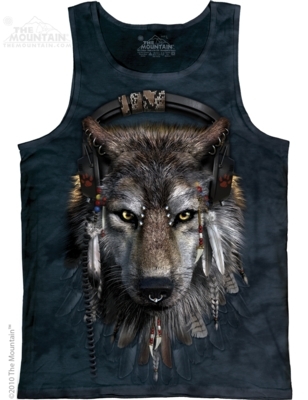 This tank top for both men and women is not only comfortable, it also has a great image of DJ Fen, the music loving wolf.�Design by The Mountain. 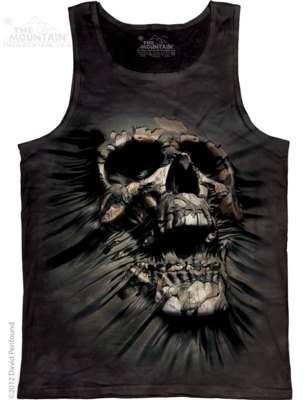 This tank top for both men and women is not only comfortable, it also has a fantastic image of a skull seeming to be breaking through the material of the tank top.�Design by The Mountain. 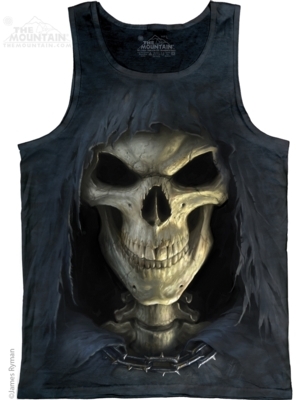 This tank top for both men and women is not only comfortable, it also has a�dark fantasy�image of a reaper, wearing chains and a black hooded cloak.�Design by The Mountain. 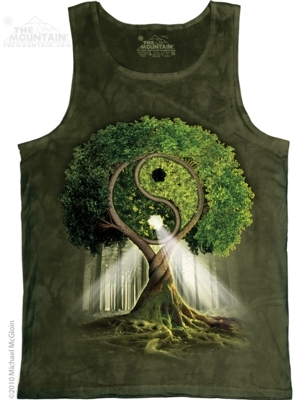 This tank top for both men and women is not only comfortable, it also showins�sunlight beaming through the�leaves of a tree, with it's�branches creating the yin yang symbol. Design by The Mountain.